4Patriots Survival Food customers are praising the quality of the product and its packaging. Nashville, TN , United States - April 11, 2019 /MarketersMedia/ — If extreme weather or a manmade disaster cuts off the food supply chain, people will want to do more than merely survive. They’re going to want nutritious, good-tasting food to sustain them during a crisis. And that’s exactly what 4Patriots LLC of Nashville, Tenn., provides in its 4Patriots Survival Food. The 25-year shelf life is important, but taste, ease of use and packaging are also essential. From what 4Patriots customers are posting on the company’s review site , that’s what they are receiving. “We want to help people survive an emergency that damages the electrical grid or disrupts the food supply chain, but we also want to provide them with great-tasting and healthy food,” said Allen Baler, Partner at 4Patriots. Baler’s company supplies a variety of products that help people become more self-reliant and independent. “I received my three-month supply kit and was impressed with the packaging and the timely arrival… I have to say it was really tasty. The potato soup was really exceptional.” – D.G. 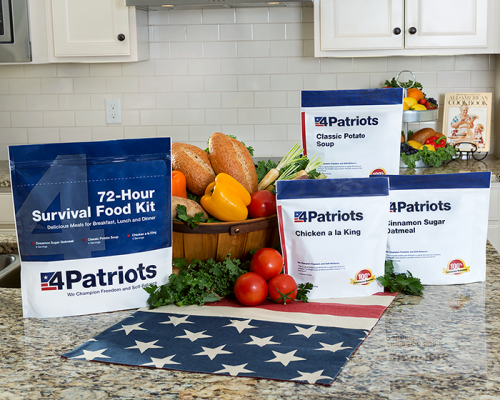 4Patriots offers five different survival food kits – 72-hour, one-week, one-month, three-month and one-year. They provide this variety due to the differences in family sizes and incomes. The food in the Food4Patriots survival kits can be prepared in less than 20 minutes and requires only boiling water. It’s contained in easy-to-store Mylar pouches, which keep out air, moisture and light. No one knows when an extreme weather event or natural disaster may occur in their area, so being prepared with good-tasting, nutritious food with a long shelf life can bring considerable peace of mind. 4Patriots Survival Food provides emergency food products that are shelf-stable for 25 years. 4Patriots Survival Food kits are made without any genetically-modified products, preservatives or fillers. The kits are available in 72-hour, one-week, four-week, three-month and one-year supplies.